The Grow Solar team has reached out to 11 communities, four of which have thus far made the commitment to participate as Growing Solar Communities, and a remaining eight have either expressed an interest in participating or have been identified as having strong potential for adopting local best practices. All of the eight have community colleges that are part of the IGEN network, and IGEN has identified local champions who can help move the Grow Solar assistance process forward. Illinois participation will include several prominent suburban cities within the metropolitan area, and significant city participation in downstate Illinois and western Illinois (which are distinct markets from the Chicago region). 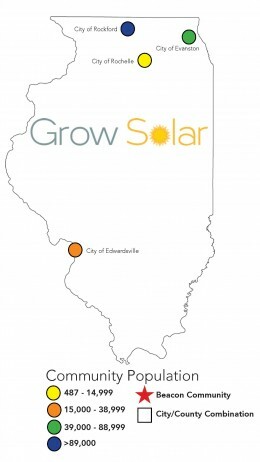 The Grow Solar team has identified several additional Chicago suburban communities that could also provide market leadership in applying best practices.